For the King Missile album, see The Psychopathology of Everyday Life (album). 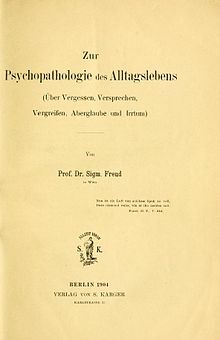 Psychopathology of Everyday Life (German: Zur Psychopathologie des Alltagslebens) is a 1901 work by Sigmund Freud, the founder of psychoanalysis. Based on Freud's researches into slips and parapraxes from 1897 onwards, it became perhaps the best-known of all Freud's writings. The Psychopathology was originally published in the Monograph for Psychiatry and Neurology in 1901, before appearing in book form in 1904. It would receive twelve foreign translations during Freud's lifetime, as well as numerous new German editions, with fresh material being added in almost every one. James Strachey objected that "Almost the whole of the basic explanations and theories were already present in the earliest edition...the wealth of new examples interrupts and even confuses the mainstream of the underlying argument". However, in such a popular and theory-light text, the sheer wealth of examples helped make Freud's point for him in an accessible way. A new English-language translation by Anthea Bell was published in 2003. Among the most overtly autobiographical of Freud's works, the Psychopathology was strongly linked by Freud to his relationship with Wilhelm Fliess. During the year 1898 I published a short essay on the Psychic Mechanism of Forgetfulness. I shall now repeat its contents and take it as a starting-point for further discussion. I have there undertaken a psychologic analysis of a common case of temporary forgetfulness of proper names, and from a pregnant example of my own observation I have reached the conclusion that this frequent and practically unimportant occurrence of a failure of a psychic function – of memory – admits an explanation which goes beyond the customary utilization of this phenomenon. If an average psychologist should be asked to explain how it happens that we often fail to recall a name which we are sure we know, he would probably content himself with the answer that proper names are more apt to be forgotten than any other content of memory. He might give plausible reasons for this "forgetting preference" for proper names, but he would not assume any deep determinant for the process. Sometimes called the Mistake Book (to go with the Dream Book and the Joke Book), The Psychopathology of Everyday Life became one of the scientific classics of the 20th century. Freud realised he was becoming a celebrity when he found his cabin-steward reading the Mistake Book on his 1909 visit to the States. The Rat Man came to Freud for analysis as a result of reading the Psychopathology of Everyday Life. The psychoanalyst Jacques Lacan considered The Psychopathology of Everyday Life one of the three key texts for an understanding of the unconscious, alongside The Interpretation of Dreams (1900), and Jokes and their Relation to the Unconscious (1905). Through its stress on what Freud called "switch words" and "verbal bridges", The Psychopathology of Everyday Life is considered important for psychopathology. Strachey's English translation is criticized by the psychologist Louis Breger, who writes that Strachey translates the word for slips or mistakes as "parapraxis" when the English "blunder" or "faulty action" would have been more appropriate, and uses the Latinisms "id" and "ego" where "it" and "I" would have better captured Freud's language. The philosopher Michel Onfray argues that The Psychopathology of Everyday Life is not scientific. Jacques Bénesteau writes that Freud added lies in each edition. 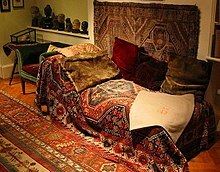 The philosopher Mikkel Borch-Jacobsen and the psychologist Sonu Shamdasani write that Freud's coupling of an analysis of his dreams and childhood memories had a precedent in Belgian psychologist Joseph Delboeuf's Sleep and Dreams, one of the major themes of which is the capacity of dreams to recall forgotten memories. ^ Breger, Louis (2000). Freud: Darkness in the Midst of Vision. New York: John Wiley & Sons, Inc. p. 378. ISBN 0-471-31628-8. ^ Borch-Jacobsen, Mikkel; Shamdasani, Sonu (2012). The Freud Files: An Inquiry into the History of Psychoanalysis. Cambridge: Cambridge University Press. p. 43. ISBN 978-0-521-72978-9.